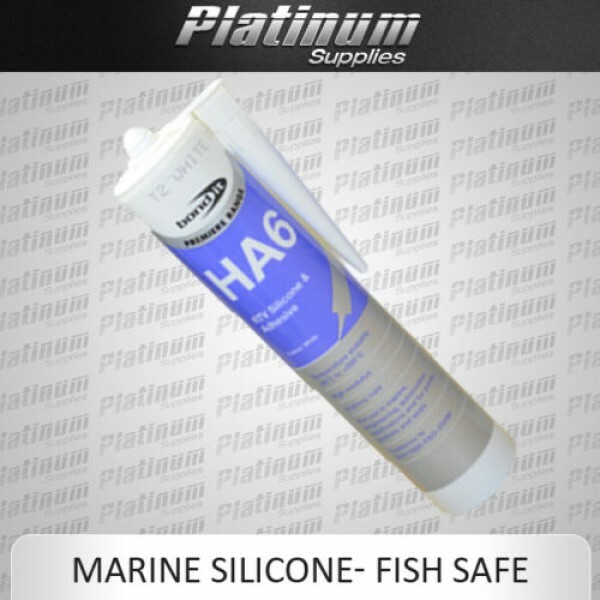 A high quality, non-shrinking, marine quality silicone sealant and adhesive. HA6 surpasses the requirements of ISO11600-F&G- 25HM. It is unaffected by UV, ozone, salt water immersion and extremes of temperature and is non-slumping in paste form. Bond It HA6 contains no fungicides or oils which may leach into water and is therefore recommended for bonding, bedding and sealing glass in aquarium construction. HA6 is also recommended for the manufacture of in-situ gaskets and seals for pumps and pipework to prevent water ingression and as a dust and weatherproofing seal for cabinets in dirty environments or external applications. Ensure all surfaces are clean, dry and free from grease, oil or any other contaminants that may hinder adhesion. Prime porous surfaces and metals other than anodised aluminium or stainless steel for optimum adhesion. Apply using a standard sealant gun with the nozzle cut at an angle of 45°, and to an opening slightly larger than the joint to be sealed. For sealing and bedding apply in the normal fashion and tool to a smooth finish one or two minutes after gunning. As an adhesive bring the two surfaces together before skinning commences and do not stress the joint before the silicone has developed strength. As a gasket apply to one surface and if the joint is to be broken allow a strong skin to develop before compressing for permanent gaskets the joint can be sealed immediately. Clean away any excess with white spirit. HA6 comes in 5 colours: white, translucent, black, brown and grey. Minimum 24 months in unopened cartridge.